Lacuna Loft is a nonprofit organization providing online support programs to young adult cancer survivors and caregivers. The only organization offering diverse online programs regardless of diagnosis and regardless of where they live, Lacuna Loft is changing the way that age-appropriate support is provided to young adults facing cancer. Survival is insufficient and we are here to make sure that survivorship support is available, accessible, and specifically designed for young adults facing cancer. Lacuna Loft’s vision is to become the leader in wellness support programs and resources for young adult cancer survivors and caregivers, enabling them to have the age-appropriate support they deserve through a medium that fits their lifestyle. 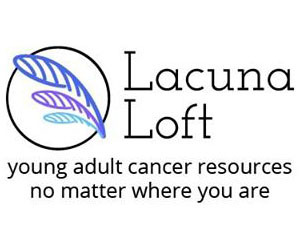 Lacuna Loft is a community funded charity that provides all programs at no charge to young adults facing cancer.